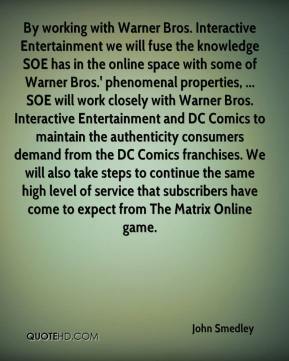 By working with Warner Bros. Interactive Entertainment we will fuse the knowledge SOE has in the online space with some of Warner Bros.' phenomenal properties, ... SOE will work closely with Warner Bros. Interactive Entertainment and DC Comics to maintain the authenticity consumers demand from the DC Comics franchises. We will also take steps to continue the same high level of service that subscribers have come to expect from The Matrix Online game. 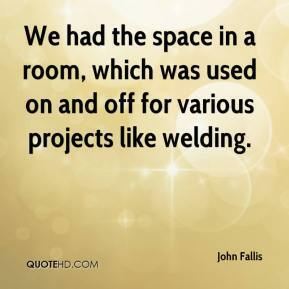 We had the space in a room, which was used on and off for various projects like welding. 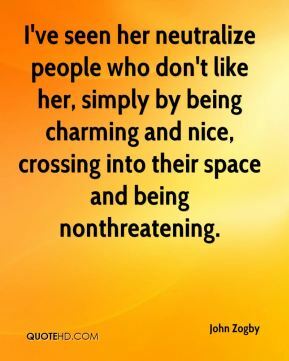 I've seen her neutralize people who don't like her, simply by being charming and nice, crossing into their space and being nonthreatening. Given the space, we've proven we can play soccer. 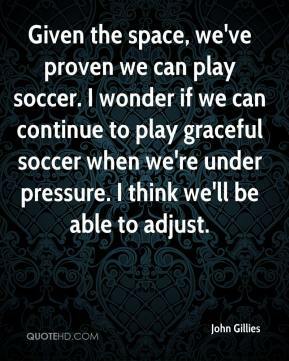 I wonder if we can continue to play graceful soccer when we're under pressure. I think we'll be able to adjust. 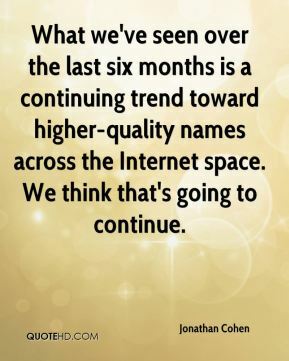 What we've seen over the last six months is a continuing trend toward higher-quality names across the Internet space. We think that's going to continue. 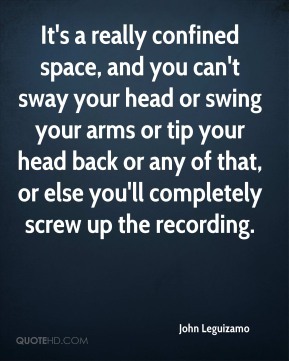 It's a really confined space, and you can't sway your head or swing your arms or tip your head back or any of that, or else you'll completely screw up the recording. 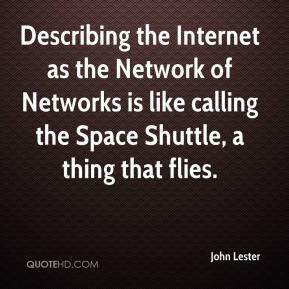 Describing the Internet as the Network of Networks is like calling the Space Shuttle, a thing that flies. 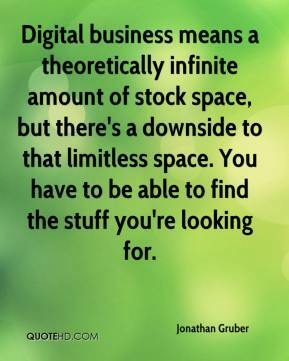 Digital business means a theoretically infinite amount of stock space, but there's a downside to that limitless space. You have to be able to find the stuff you're looking for. 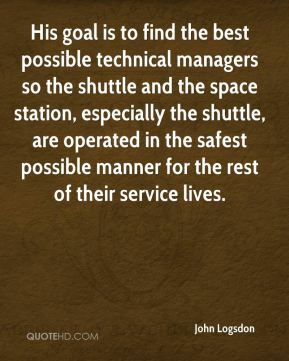 His goal is to find the best possible technical managers so the shuttle and the space station, especially the shuttle, are operated in the safest possible manner for the rest of their service lives. 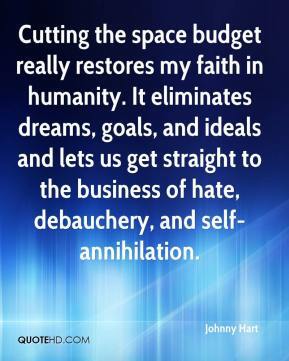 You can't start talking about space until you set an overall policy. 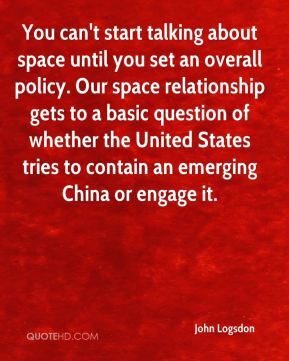 Our space relationship gets to a basic question of whether the United States tries to contain an emerging China or engage it. 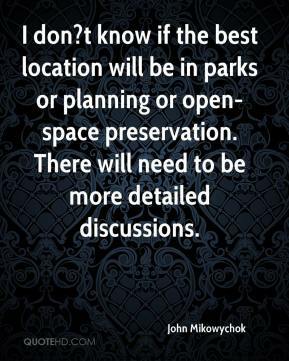 I don?t know if the best location will be in parks or planning or open-space preservation. There will need to be more detailed discussions. The benefits (of recycling) are obvious. You're not using up space in the landfill. 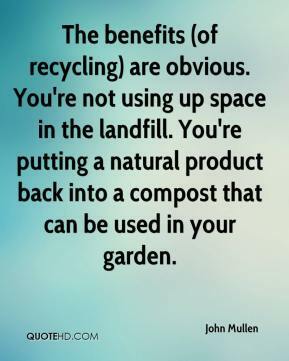 You're putting a natural product back into a compost that can be used in your garden. 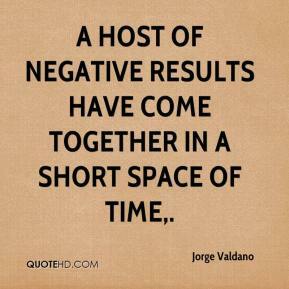 A host of negative results have come together in a short space of time. Sun identified China as a major player in the world IT space years ago and made a concerted effort to introduce and encourage the adoption of Java technologies that is paying off in mindshare and use among Chinese wireless developers today. 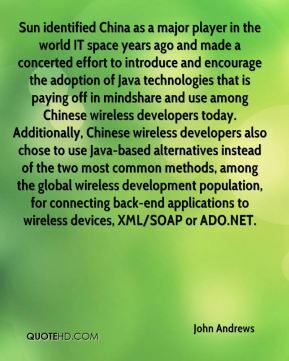 Additionally, Chinese wireless developers also chose to use Java-based alternatives instead of the two most common methods, among the global wireless development population, for connecting back-end applications to wireless devices, XML/SOAP or ADO.NET. 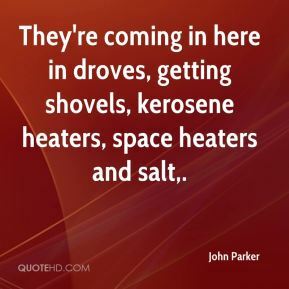 They're coming in here in droves, getting shovels, kerosene heaters, space heaters and salt. 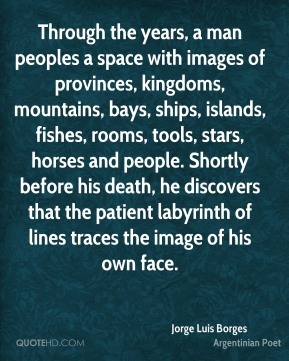 Doubt is thus the space between reality and the application of an idea. It ought to be given over to the weighing of experience, intuition, creativity, ethics, common sense, reason and, of course, knowledge, in balanced consideration of what is to be done. 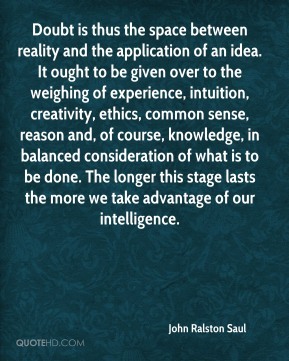 The longer this stage lasts the more we take advantage of our intelligence. 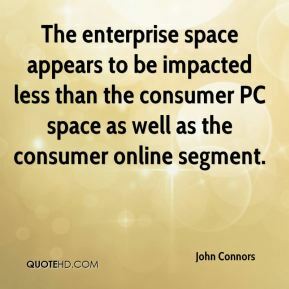 The enterprise space appears to be impacted less than the consumer PC space as well as the consumer online segment. 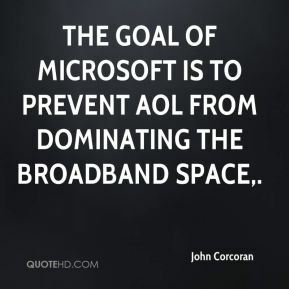 The goal of Microsoft is to prevent AOL from dominating the broadband space. 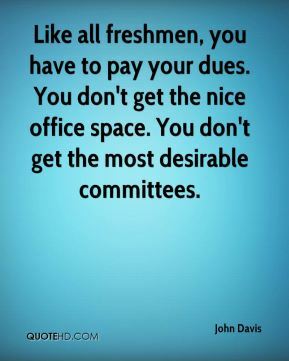 Like all freshmen, you have to pay your dues. You don't get the nice office space. You don't get the most desirable committees. [TIG Real Estate Services in Dallas is offering to help businesses find temporary operating space.] We are putting our entire team into this effort. We will do all the legwork necessary to relocate them. We will find the space they need on an interim basis, ... and the tenant will not pay anything. 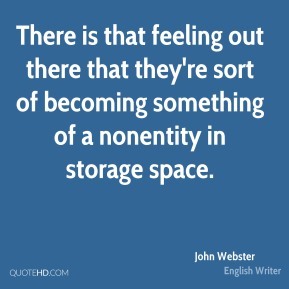 There is that feeling out there that they're sort of becoming something of a nonentity in storage space. 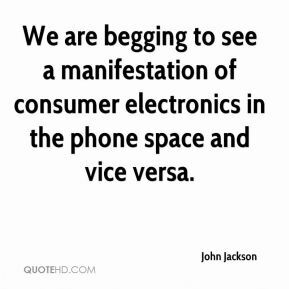 We are begging to see a manifestation of consumer electronics in the phone space and vice versa. He's a big factor. 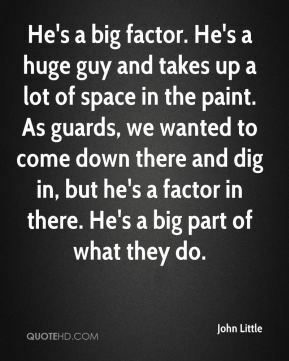 He's a huge guy and takes up a lot of space in the paint. As guards, we wanted to come down there and dig in, but he's a factor in there. He's a big part of what they do.